Multitrack mixing / mastering is the most advanced way of mastering. When using our online mixing service you provide us all the separate instruments, vocals, and sound effects. Each file contains a single element of your song. (E.g. Vocal, Piano, strings, bass line, bass drum, etc.). Besides our online mixing service we also provide stereo mastering and stem mastering. Stem mastering can be a good and more affordable alternative for online mixing. What are the benefits of multitrack mixing / mastering? With multitrack mixing / mastering we have access to all the individual elements of your song. Having access to all these elements we can apply changes to each element separately. Therefore multitrack mixing / mastering gives us endless possibilities to optimize your music. Do my tracks need to be mixed? If you are not sure that your music can benefit from our online mixing service rather than stem mastering or stereo mastering you can send us your mix so we can take a listen. We prefer soundcloud links. Please send an e-mail to contact@digitalmastering.nl including a link to the track. It’s not so hard to create the files needed for our online mixing service. Below a few tips. Label and organize the tracks of your song properly. Remove all compression and limiting on the master output of your DAW. Leave sidechains, automatic filters, reverbs and delays turned on. You could render a seperate file that includes only the reverbs and delays. Noise shaping and dithering should be turned off. Make sure the audio does not clip. For best results try to keep the peak levels anywhere between -20 and -0,1dB. Export the individual track as aiff or wav. The minimum bit depth should be 16 bit. But for mixing 24 bit is better. The minimum sample-rate should be 44.1kHz. Make sure that you export each track from the beginning of your timeline. So each track has the same starting point. Import all the rendered tracks in your DAW and line them up. Hit playback and listen if the everything sounds the way it should. Prepare the tracks for upload by adding all the tracks and folders to a zip file. Our Online mixing service that includes mastering can be handled by our web interface. 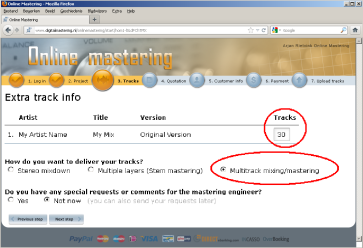 In step 3 of the web interface you can mark the multitrack mixing / mastering option. Don’t forget to mention how many tracks your song has. The web interface will calculate the costs and will give you a quotation. Of course the result of our online mixing service greatly depends on our mixing and mastering skills. We have more than 20 years of experience in mixing and mastering various types of music. During these years we have had many satisfied customers. Check the credentials on this page. Also check our discography for a selection of the work we did in the past. Use high quality sounds / samples / synths / vocals /recordings. The better your tracks sounds before the mixing and mastering, the better the result will be after the mixing and mastering. Make sure you properly prepare your song for mixing. For tips look at how to prepare your music for online multitrack mixing / mastering.